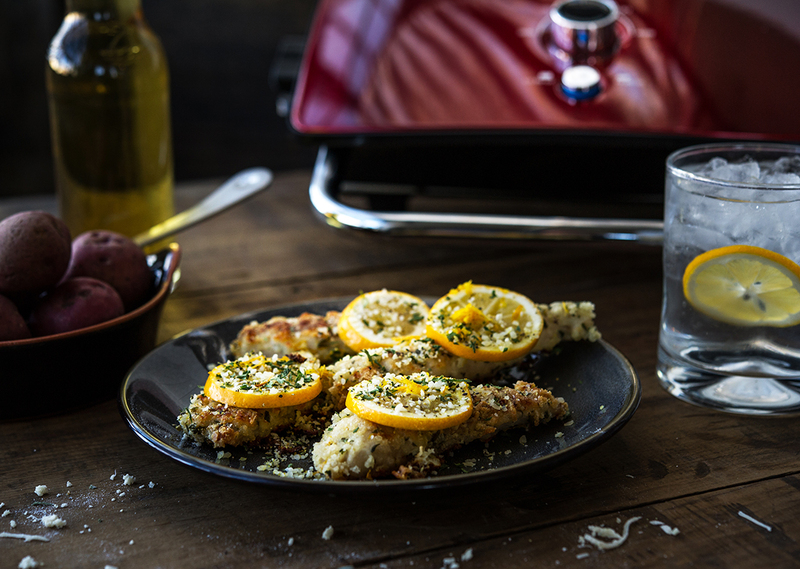 The sharpness of Parmesan and citrus of lemon bring out amazing flavors for this dinner staple. Preheat George Foreman Grill and Broil to 400°F. Grab three bowls. Add flour to one bowl. Combine bread crumbs, ½ cup grated Parmesan cheese, dried parsley and about 1/2 teaspoon each of salt and pepper and stir. In final bowl, add 1-2 teaspoons lemon zest, 4-5 tablespoons lemon juice, minced garlic, and 5 tablespoons melted butter. Stir. Remove 4 tablespoons of this mixture and set aside. Slice chicken breasts to size of tenders (about 1-inch strips) or use chicken tenders. Coat in flour, heavily dredge in garlic-lemon mixture, and then coat in Parmesan bread crumb mixture. Place on prepared sheet pan. Use any remaining Parmesan bread crumb mixture and sprinkle over tenders. Sprinkle lemon pepper seasoning over tenders. Place chicken tenders on preheated grill. Grill for 8 minutes per side and flip tenders to other side. Use oven mitts or hot pads to remove top grill plate and place on heat resistant surface. Sprinkle chicken tenders with remaining cheese and turn Grill & Broil to "Broil" function after removing top grill plate. Allow to broil until crispy top layer forms and cheese is melted but not burnt or approximately 2 minutes. 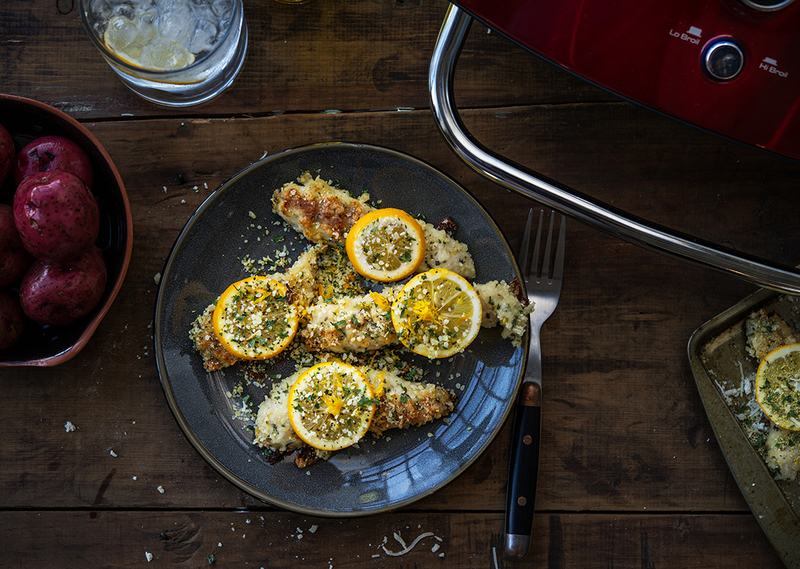 If desired, place lemon slices over chicken (optional). Meanwhile, whisk remaining 3 tablespoons melted butter, 3 tablespoons lemon juice, 1-2 teaspoons lemon zest, 3 tablespoons olive oil and 3 tablespoons honey in small bowl. Add some pepper and parsley if desired. Remove from grill and top with honey-lemon mixture and fresh parsley, if desired, and enjoy immediately.